The Boston Bruins’ Stanley Cup win is a distant memory for sports fans in New England and we didn’t find much to cheer about as we watched our Red Sox fizzle in September, but the team at the Help A Little One Foundation chalks it up as another winning season because YOU still champion the children who cannot advocate for themselves. As supporters of the Help A Little One Foundation you make our Family Circle program possible, as well as the individual gifts we make to enhance the quality of life for children with severe neurological impairment. You are part of a small army of people who remember that individuals with severe disabilities deserve to live a life as fulfilling as anyone else. Your kindness expands their horizons and makes all of our lives worth living. Twice each year we share stories about those who make life better for H.A.L.O.’s children. I hope you enjoy getting to know people like Peg Knox and Mike Andrews. They are the people we all strive to be. Thank you as always for your continued good wishes and generosity. The Seven Hills Foundation and Tufts University School of Dental Medicine have collaborated to open a dental clinic for individuals with developmental disabilities at Seven Hills Pediatric Center in Groton, MA. About 250 patients with physical and developmental disabilities have been treated at the Susan and Richard Smith Family Foundation Dental Clinic since it opened in May. Dr. Karen Chang, director, and a staff of three expect to serve about 600 developmentally disabled individuals in the region annually. The dental clinic provides comprehensive services including cleanings, x-rays, fillings, periodontal treatment, root canals, prosthodontics and oral surgery for patients from age six months through adult years. Patients are usually seen four times a year, instead of twice, because their disabilities make it difficult to practice regular oral hygiene. 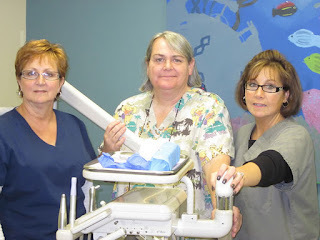 “It takes a special kind of person to work with this population,” says the clinic’s dental assistant, Donna, who worked for Developmentally Disabled Services (DDS) before training for the position. The staff focuses on accommodation as well as technical expertise because the patients may be confused or frightened about treatment. Collectively, they have nearly a century of experience and stay current with new practices in the field; for instance, a recent training involved protocol for seizures. Linnea, the clinic’s office manager, said parents often leave the office in tears because they are so happy to finally find a dentist that can treat their children. “They apologize over and over when a patient screams or moves around, but we understand. . . . They’ve had to fight for everything for their child, and then they find us, people who understand,” she said. “They cry. We cry. We get lots of hugs,” said Donna. To learn more about The Smith Family Foundation Dental Clinic call 978.448.3388 ext 354. One day the Andrews family took a vacation, leaving their profoundly disabled daughter in the competent hands of respite staff at Mayflower (now Radius) Pediatric Center in Plymouth, MA. When they returned her giggles and smiles told them she had enjoyed her stay. inspired her family to build a playground. Mike, who works in the construction supply business, and his wife Patty, a nurse, soon got back into the routine of work and 24 hour care. 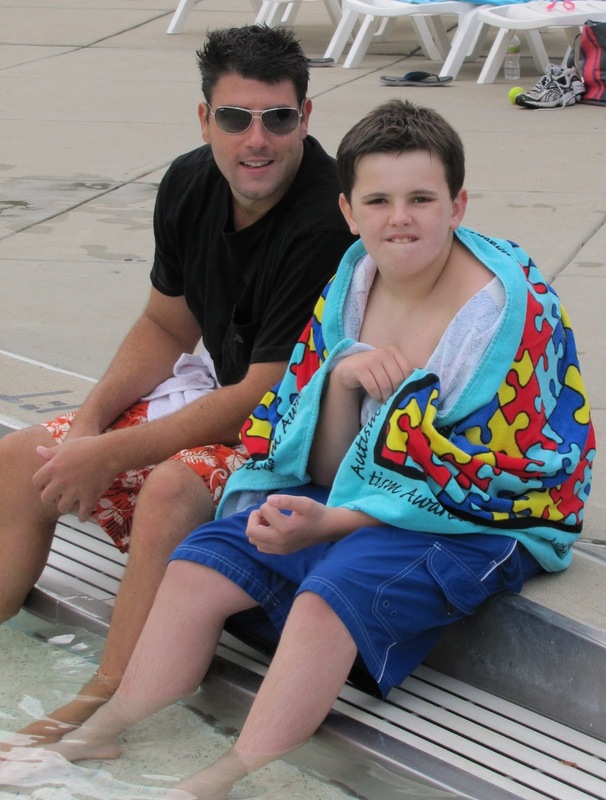 Shannon had a condition known as lissencephaly. A small army of therapists, teachers and nurses came to their house to provide services to the little girl who depended on others to meet all her basic needs. The family became active in the Parent Advisory Council at the Radius Day School. PAC sponsored carwashes and Tupperware sales to raise money for an accessible playground but after five years they weren’t even close to the thousands needed. 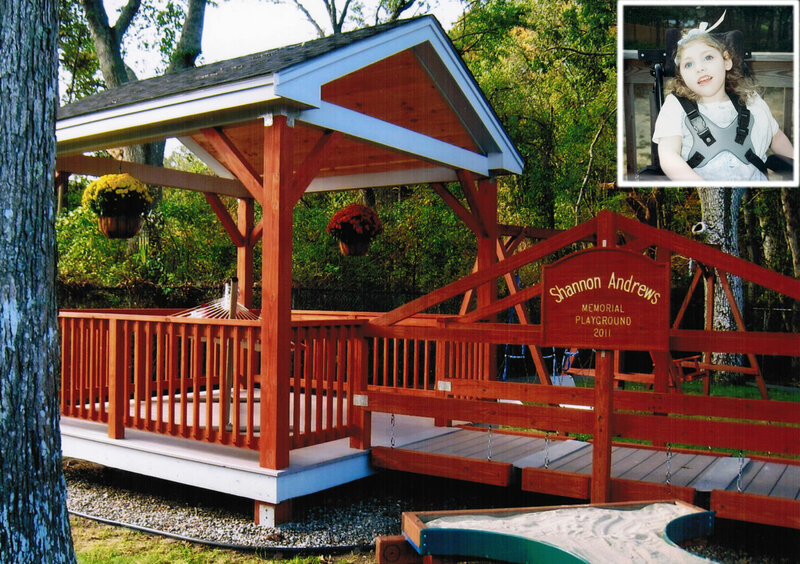 So when Shannon passed away in 2009 at age 21, Mike, Patty, and Shannon’s two younger sisters, Meg and Kaelin, suggested donations as a fitting memorial. “Shannon thrived at Radius and we wanted to give something back,” said Mike. Donations from local lumber companies and community groups put the fund over the top and construction finally got underway in April 2011. Mike used his architecture background to design the covered play areas and enlisted friends such as Al Cedrone and Tony Salvucci to help him build the playground on Saturdays. As word spread, Carpenters Local 33 of Boston got involved. “Every week people who didn’t even know me, or Shannon, or my family, showed up and put in time,” Mike said. Linda White, director of education at the Radius Day School, said the Shannon Andrews Memorial Playground provides expanded learning opportunities for day students and residents. “Everything is within reach. All but one of our students are in wheelchairs, so the ramps and railings give them safe access to covered outdoor areas. Next spring we plan to introduce activity boards to work on fine motor skills and attention goals outside. The kids can experience movement in two hammocks and sensory stimulation in the sandbox and other play space,” she said. When Margaret “Peg” Knox was in sixth grade, she was asked what she wanted to be when she grew up. It was a toss up: either a cook or a nurse. She ended up in pediatric nursing, making a life’s work of caring for disabled and medically fragile children. “In her 43 plus years at Cedarcrest Center, Peg has at every turn worked to make Cedarcrest a home first and foremost: a place where each child is loved, cared for and ensured an opportunity to do all the things children do,” says Cathy Gray, President and CEO. As technology increased survival rates for children with complex conditions, the job changed. The children being admitted to Cedarcrest Center for Children with Disabilities were much more medically fragile. They required equipment like G-tubes for feeding and tracheostomies and other respiratory support. After a while the increased use of life supporting technology took over too much floor space, and in 1990 Peg supervised a move down the mountain into the current, modern facility in Keene, NH. 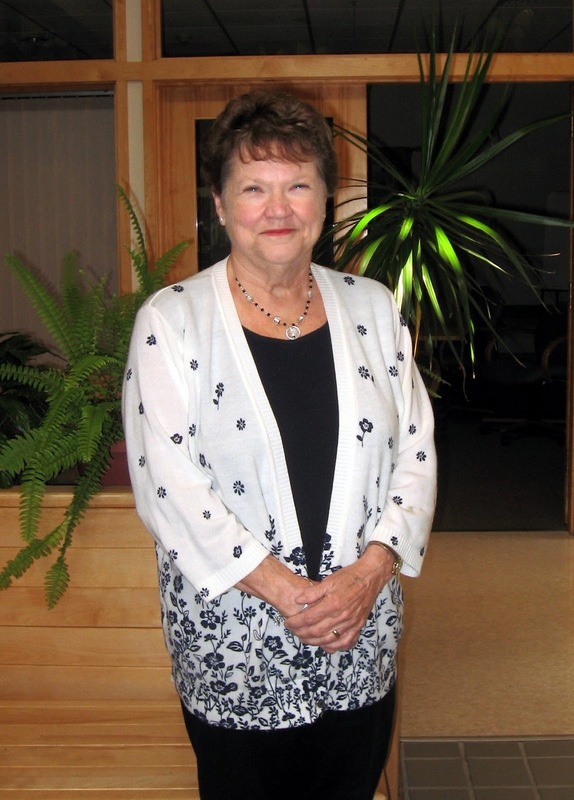 For the past 21 years Peg has continued to deal with change as Director of Nursing Services. When no New Hampshire facility offered ventilator and IV care, she trained her nurses so families would not have to go out of state. As the need grew for short term stays and post operative special care for medically fragile children, Peg qualified the staff to meet their needs. Even though Peg has been on call 24/7 for most of the past two decades, she doesn’t like to acknowledge any personal sacrifice. She says it’s part of the job to get out of bed in the middle of night to manage a medical crisis or stay with a child in the emergency room until the family can arrive. “Families are so vulnerable in these situations, they need to know we are in their corner and their child is going to get the best care possible,” Peg said. Peg is famous for bring Cedarcrest’s children and families together with her native Keene, NH community at events like the Spring Prom and annual picnic. Her loyal quilting and sewing groups across the state are legendary for the beautiful curtains, quilts and accessories they hand make for the children’s rooms. Even the child-size stretchers and positioning pillows have a whimsical, colorful touch because of “her” volunteers. “Appreciation is what keeps people connected,” Peg said when asked for her secret. To learn more about the Cedarcrest Center visit http://www.cedarcrest4kids.org/. Families who care for children with disabilities at home have expressed heartfelt appreciation for H.A.L.O.’s Family Circle “Swim and Sing” respite program. They say they have to look far and wide to find social activities for their children. Our three hour of activities on Sundays provides socialization, physical movement and just enough time for parents to take a break from responsibilities. The program is offered in Newton, Massachusetts and will open in Stoughton, MA soon. “It’s perfect for Alex because she loves music and the only sports activity she is capable of is swimming,” says Michele, whose daughter Alexandra was born with a brain disorder and had a hemispherectomy to correct seizure problems. They have been participating since 2007, coming straight from Sunday Mass to the pool, she said. When the family lived in Iowa, Michele said only one activity was available to Alex outside of school, and it was not a year round program. In New Jersey, the family was forced to choose between desperately needed home respite services or outside activities, so opportunities to interact with peers were limited. Now 25, Alex goes to a day habilitation program during the week, and is on waiting lists for a few weekday activities offered in her community. The Sunday program at the Newton JCC is Luke’s preferred activity, according to Christine, who says he looks forward to it. He attends two to three times a month and would gladly go more, she said. 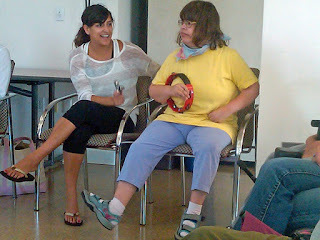 H.A.L.O.’s board of directors recently renewed its commitment to fund Family Circle activities for another five years. This means 18 families will benefit from recreational services at the Newton location over a 30-week schedule and at least 10 more families when the Sunday program resumes in Stoughton at the YMCA. Jewish Family and Children’s Service of Boston manages the programs. For information contact Melissa Demir at 781-693-1344.